Alright, let’s talk about that “special bread” I’ve been mentioning for the past two days. I know I was a little bit of a tease and honestly, I promise I would have given it to you sooner…but first, I had to remember the ingredients that I used and actually write them out. Whoops. 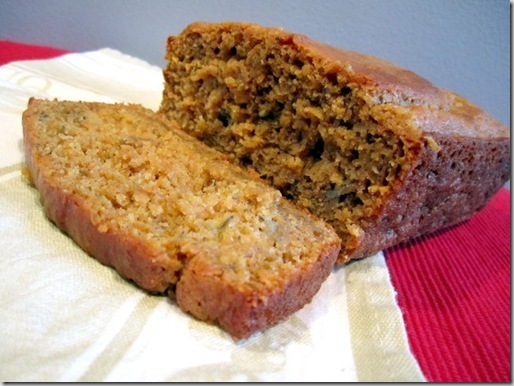 This bread actually incorporates two of my favorite healthier bread recipes in a way that just works: a yummy fusion of banana + pumpkin bread. I’m warning you that they incorporate my “healthier” bread recipes because I don’t want you to end up like Jay did when he took his first bite and was disappointed that it didn’t taste like his mom’s pumpkin bread. Oil and all though, my mother-in-law does make an amazing pumpkin bread. It’s not healthified in any way, shape, or form, but it’s a holiday treat and I always savor every last bite. Actually, it usually doesn’t take Jay and I more than a couple of days to finish off the loaf. But now, lucky for me, I’ve got a new bread in town that can be enjoyed more than once a year and can keep me AND my waistline happy. So I guess I can’t feel *too* bad about finishing off the loaf all by myself in one week, right? In a large mixing bowl combine bananas, Chobani, sugar, egg substitute, and pumpkin. Add both flours, baking soda, salt, baking powder, cinnamon, pumpkin pie spice, and nutmeg to the pumpkin mixture. Mix until just combined, and the batter is free of any lumps. 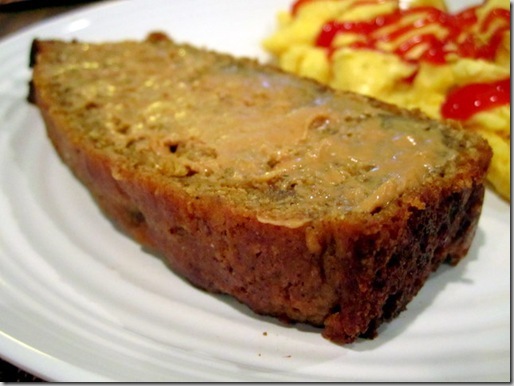 Pour batter into a 9×5 inch loaf pan sprayed with nonstick cooking spray. Bake for about 45-50 minutes, or until toothpick inserted in middle of bread comes out clean. Enjoy! Enjoy a slice cold, or reheated in the microwave for 15 seconds, topped with pumpkin butter, or with peanut butter. Either way, it’ll taste delicious! Courtney, this recipe looks fantastic! I really wanted to do some baking tonight anyway, so maybe this will be in the mix...however, do you know of what I could use in place of the yogurt? Hmmm, maybe applesauce? Or oil? I'm just not sure how the consistency would be effected since the yogurt makes it so moist. If you give it a try, let me know! This looks delicious Courtney! 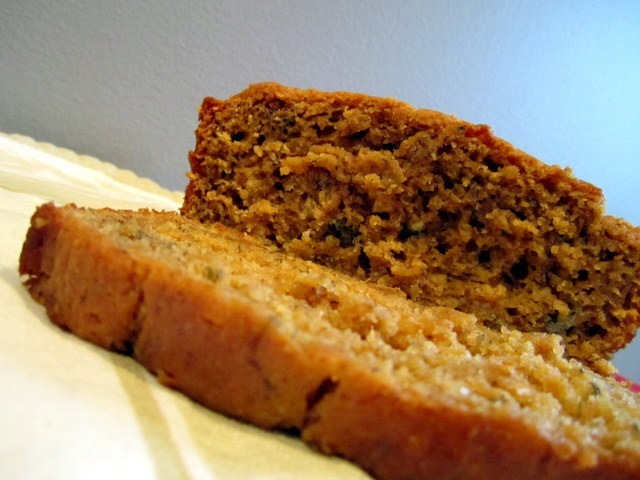 I love pumpkin flavored things and banana bread, so I think this is a great combo! Thanks for sharing! 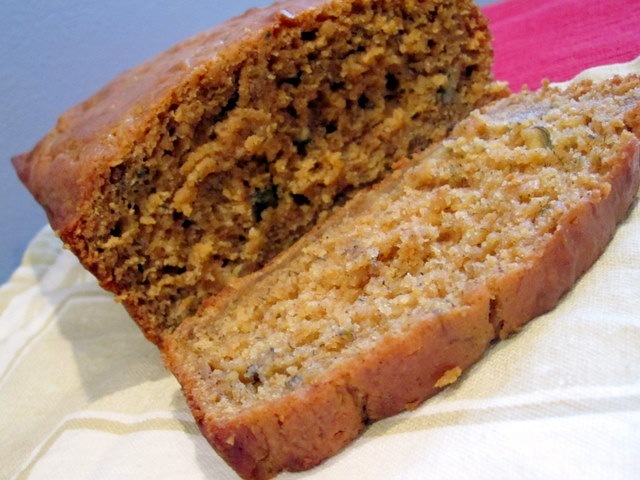 I came up with a Pumpkin Banana Bread recipe somewhat recently too (you can view it here: http://www.myfoodnfitnessdiaries.com/2011/10/04/pumpkin-banana-bread/) that I've been LOVING lately!! Both the bananas and the pumpkin together make the bread so moist and soft! I love it with peanut butter. I want to try out your recipe too - looks delish! You just proved it doesn't have to have oil in it to be delicious, oil does help though! Looks delicious! I feel like I always have to preface my baked goods with "this is healthified" to my husband otherwise he expects some sugar laden treat! yum!! This may have to be my first pumpkin bread of the season!! My brother thinks this bread looks delicious. I don't like bananas but i LOVE pumpkin! Yumm! Looks amazing! Could I use egg instead of egg substitute? Yum! 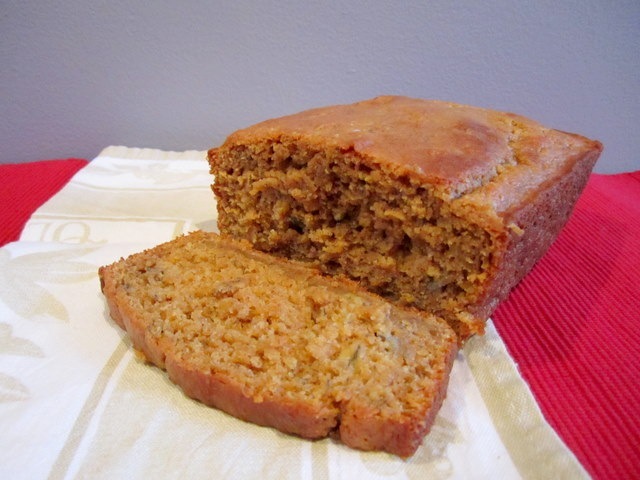 I made some of this too although I called it Banana Pumpkin Bread and used totally different ingredients (besides the nanner and pumpkin lol). I will have to try this one out! Here's mine: http://semihealthnut.blogspot.com/2011/08/banana-pumpkin-breadfall-is-sooner-than.html I am curious...what's the difference between pastry flour and regular flour?? We should sound alike! :) I made a "healthy" loaf of banana pumpkin bread with the addition of yogurt raisins and have pretty much been eating it twice a day and I will probably finish it all by myself too! It may not have a ton of oil in it, but it still looks really moist! And I love the idea fo combining pumpkin and banana! it sure doesn't *look* healthy, which is a good sign! :D looks awesome courtney..i'm all about pumpkin/banana breads, so this recipe will definitely be utilized! Why have I not combined banana and pumpkin before? This combo his hitting me like a train, I can't wait to try it! I'm making a healthy pumpkin mousse for Thanksgiving and I think this would go great with it! "Of course it won’t honey. It doesn’t have a cup of oil in it.”--> hhahahaha, love this! That bread looks really good. I'm going to a Thanksgiving potluck, so I may try this! Thanks for posting! Yum! This post had me drooling. Can't wait to try it out! mmmmm that looks delicious - I love healthified recipes. Yes I'll admit I can taste the difference but I don't mind it and i genuinely like it as much as the less healthy stuff! I guess it would defeat the purpose if I added chocolate chips. This looks delicious and I have two brownish banana's just sitting on my counter! This looks sooo good! Moist, rich, and perfect! I bet the yogurt in it just makes it that much better. My mom and grandma use that trick to keep things from drying out. If I wanted to use just plain ol' egg in place of its substitute, how many would you suggest using? And one last thing, do you think it would be noticeably different in taste if I used a plain Chobani instead of vanilla? So many questions, particular baker here... Lol, sorry!